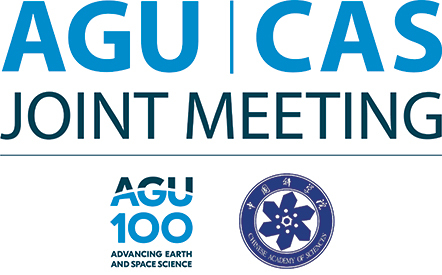 All presenters MUST be registered to attend and present at the AGU-CAS JING Meeting. Note that registered guests are not allowed in the poster hall; guest are not allowed in the scientific sessions. Only registered scientific attendees may enter the poster hall. Please have your meeting badge visible for the security guards at the entrance to the hall. Wednesday, 17 October: 4:30 P.M. – 6:00 P.M.
Friday, 19 October: 3:30 P.M. – 6:00 P.M.
To locate your assigned poster board, note that the final digits of your final paper number. This number is also your board number. Each poster board will be marked with an individual number. For example, paper “ajmp86”, will have the board marked with “086”. The boards are numbered sequentially (001 – 223) from the beginning to the end of the hall. Posters (in session 1, 17 October) should be set up in Tuesday, 16 October from 3pm-6pm. if possible. Posters (in session 1, 17 October) must be removed before 3 pm Thursday, 18 October. Posters (in session 2, 19 October) should be set up in Thursday, 18 October from 3pm-6pm. if possible. Posters (in session 2, 19 October) must be removed before 3 pm Friday, 20 October. Materials (i.e. push pins) are available at the Poster Help Booth. See below for more information on the Poster Help Booth. Presenters must be available for at least 1 hour during their poster session. Signs indicating when you will be at your presentation can be picked up at the Poster Help Booth. After the session, please leave a note on your poster board as to where you can be reached in case someone wishes to discuss your research further. Please be aware, posters remaining after the times mentioned above will be removed and recycled to make the board available for the following posters. The Poster Help Booth is located in Poster Hall. Staff will be available to provide assistance in locating a poster, providing supplies such as push pins, tape, and scissors, and answering general questions. If you need additional supplies, please feel free to bring them with you to Xi’an.